It’s called Feldenkrais, and it’s a method of movement that my brother told me about named after its inventor, Moshe Feldenkrais. As a dancer and choreographer, he was introduced to it recently and learned that this method also has benefits for people with central nervous system problems. I did a bit of research and found a place here in Copenhagen that offers lessons and also discovered that an American instructor was visiting and would give a workshop. One of the things that really struck me was the idea that as children we are fascinated by most everything around us and take the time to discover things along the way. As adults, we are more concerned with getting things done and not taking the time to pay attention to how we get there. I instantly recognized myself as the “go getter” I am. He (Feledenkrais) looked at the processes that occur in us as human beings. He saw that four things were always going on – thinking, feeling (on the emotional level), sensing (taking in and processing information), and moving. He believed that a shift in anyone of these aspects had the potential to produce a shift in the whole self, thereby bringing about change. Awareness Through Movement® lessons are a series of structured movement sequences that groups of people are led through verbally, utilizing attention, perception and imagination (The experiment in sitting and standing is a good example of part of an Awareness Through Movement lesson). There are over a thousand different movement lessons with movements ranging from developmentally based patterns to exceptionally innovative configurations. The movements are usually done lying down or sitting and at a pace and range that honors each participant. The major criteria for the quality of movement is comfort, ease and the development of each person’s inner authority. Functional Integration® is a hands-on modality specifically designed to meet the needs of an individual. The practitioner, primarily through the use of his hands , guides the student towards a new or more varied use of themselves. The student is usually lying down or sitting and is fully clothed. The quality of touch is non-invasive, informative and interactive in nature. During the session I went to, we went through a couple of exercises which were very light and comfortable. There was focus on extending the range of motion of the hip especially and working to incorporate the entire body. What started as a simple bend of the knee (laying on your back) turned into a complete movement also involving the arms, feet and torso. Once an understanding of the integration of body parts was achieved, it was practiced slowly and deliberately to one side and then the same motions were made to the other side of the body but only in the imagination – not by actually physically moving. The result was an intense relaxation, lightness and almost floating feeling. It was simply incredible. That was the immediate reaction. It must have something to do with the neurological conditioning and visualization combined that creates this chemical reaction or release of endorphins. I haven’t figured this part out yet. What I discovered was the following day I became instinctively more aware of everything I was doing. How I stood, walked, stirred my oatmeal, etc. It reminded me of when I used to work for UPS and learned the proper way to move while lifting packages. Sayings like “pivot, don’t twist,” “lift with legs not your back,” starting popping back in my head. I also noticed that I became more clear headed and open. I feel like I have more capacity, a wider attention span and just a better rhythm. The key just may be the torso. 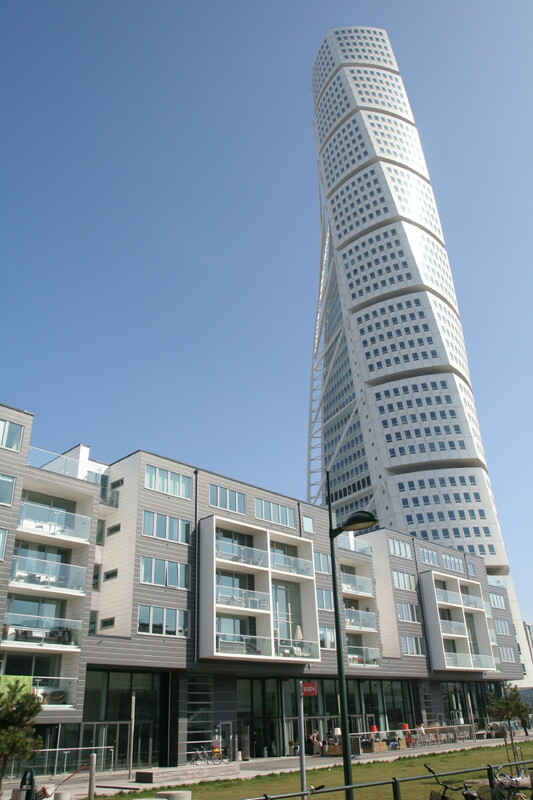 It’s fitting that a follow on workshop was held in Malmo this past weekend near the Turning Torso apartment building. Becoming more holistic in life doesn’t only involve being green or buying organic, it also has a lot to do with how completely you move and if you are integrating yourself as one. It’s not as obvious as you think. I don’t know the reason why I cannot subscribe to it. Is there anybody getting identical RSS problems? Anyone who knows the solution will you kindly respond? Thanx!! I’m amazed at how easy you make this topic look via your articles, but I must confess I still don’t quite fully grasp it. how intricate and broad it all is.. Nevertheless, I’m happy to see what you have to say in next posts: with luck , I’ll be able to grasp it eventually. ← Oh to be Danish!…and live in America!